Next time you’re walking Downtown you now have a reason to look up from your phone screen (other than crosswalks). A small strip of the 'L' on Wabash Ave between Monroe and Adams is now lit up with flashing neon patterns that change over time. 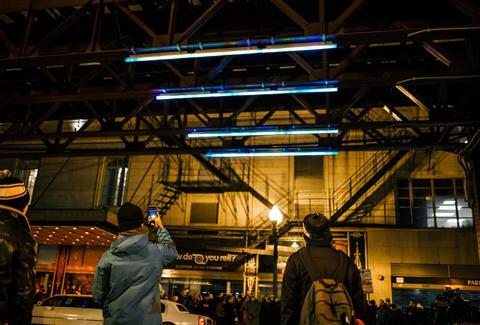 It's all part of a larger, interactive public art project in the works for The Loop -- The Wabash Lights -- that could transform the iconic, gritty structure of the CTA with a more futuristic shade of Tron. The current setup is a small test, but there's more to come according to co-designers and Chicagoans Seth Unger and Jack Newell. The two, who met in an improv class 10+ years ago, had been tossing around ideas for their public arts display for nearly four years before their recent year-long fundraising and community outreach campaign for the project. Their Kickstarter round last summer raised nearly $60,000 from almost 1,000 backers, which helped install the beta version of the lights installation currently in place for the next 6-12 months. The test lights take up just a 12x12ft portion of the tracks, compared to the full two block light installation it aims to be down the road, but it's an exciting start to seeing the concept finally being brought to life in The Loop. "We were attracted to the history of that area on Wabash, which has lost a little bit of its shine over time," says Unger. 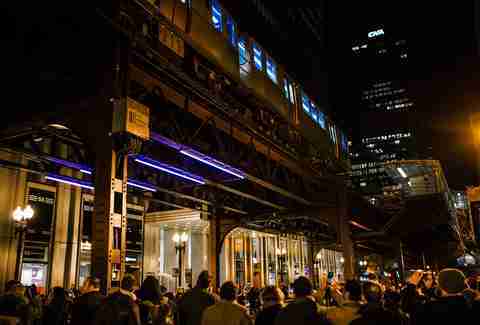 As for the tech behind the project, the chosen Philips' iColor lights are precision-controlled LED fixtures with intelligent color light, they're designed to sustain the inevitable track vibrations and Chicago climate, and can be easily controlled for public displays like bursts of rainbow colors on a whim. Specially designed clamps lock the lights in place to avoid the metal to metal connection on the tracks that would, you know, make them explode. "We chose these particular lights because of the capability they have in terms of design, and they can be controlled over Wi-Fi to change the colors. We needed some way to talk to the lights for this project," says Unger. "We wanted to bring as many people into a piece of public art as possible, and to make something that the public and the City of Chicago can proudly co-own together." 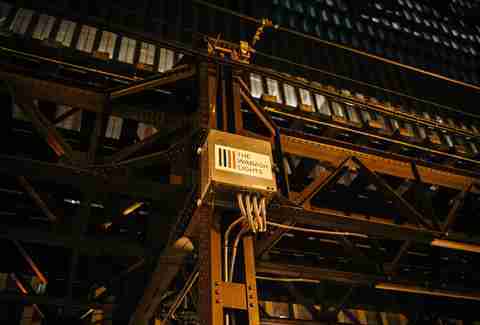 Ultimately, Unger and Newell want to make the lights display under the tracks very interactive. They're working on a website and app that'll bring as many people as possible into the project's fluid look and feel. They're working with Chicago digital design firm Table XI to develop an interactive system now that the lights are installed and ready for testing. "We want to create an app that has different engagement dimensions. 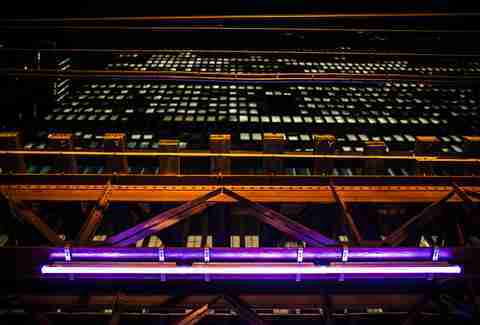 So you might open up The Wabash Lights app and there'll be different ways you can create a design for the lights. One of them might be by playing a game or one might be through uploading video and photos from your vacation, which would then be incorporated into a design for the lights," says Unger. They're creating a system that could operate like a combination of OpenTable and a Google calendar, so you can see what dates and times are open to select for display, then you'll know when the lights arrangement inspired by your bachelor party in Vegas will go live and plan your dinner downtown together accordingly. The designer’s hope is that the installation will keep people in The Loop longer after work hours, revitalize the area for businesses by making it a more attractive and safe section to walk between Michigan Ave and State St, also giving the city an extra cool arts draw. Through the beta stage, they'll be troubleshooting for any issues that might arise on a greater scale later, and raising funds for the rest of the lights and web/app development. Nicole Bruce is a contributing writer for Thrillist with a penchant for public art and shiny objects. Find her on Twitter at @nicoleabruce.